Hundreds of motoring enthusiasts took part in a car cruise at the weekend in memory of a city crash victim. Shaun Allan, 26, who lived in Westhill, Inverness, was a passenger in a Ford Focus RS on his way to work when it left the B851 road at Farr last year, ploughing through a garden fence before hitting a tree. In an effort to keep his memory alive and mark what would have been his 27th birthday, Shaun’s best friend, Darren Cameron, 25, hosted a car cruise, with a convoy heading from Inverness Retail Park to Bogbain Farm on the outskirts of the city for a barbecue and fireworks display. 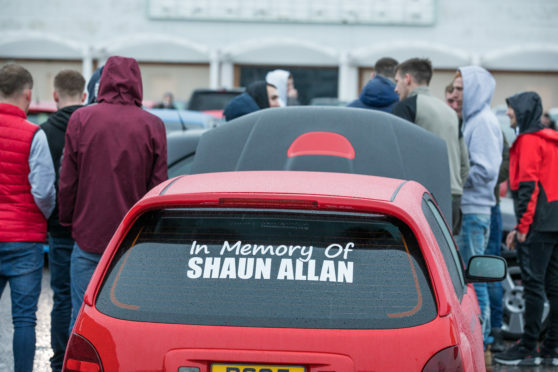 He said: “It was a great turnout in memory of Shaun, with at least 150 cars taking part. “The event went really well and the fireworks were brilliant, despite the weather. “Shaun was my best mate and was a passenger on the way to work and the car came off the road and collided with a tree. The event also raised funds for Mikey’s Line, a charity which Mr Cameron says is a cause “close to a lot of people” in his age group. Police had warned motorists of possible disruption, but a spokeswoman said the event went ahead with out issues. Mr Cameron added: “The weather was really poor, but the police helped out as we went towards the A9, so I would like to thank them for their support.